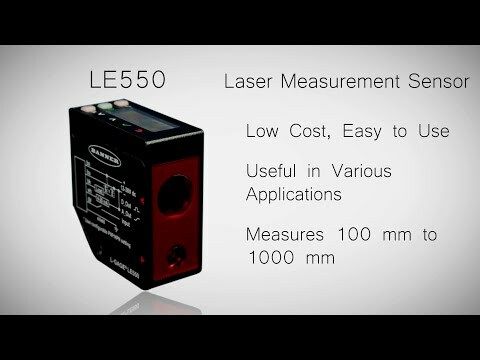 Minneapolis, MN—April 1, 2014—Banner Engineering introduces the new LE550-Laser-Measurement-Sensor/ LE550 laser sensor. Designed with linear array technology, the LE550 non-contact laser sensor provides high repeatability and accurate measurement for challenging targets ranging from shiny metal to black rubber. With easy, ready-to-use operation, the LE550 measures 100 mm to 1000 mm right out of the box—making it an ideal detection solution for diverse measurement applications, including roll diameter, loop control, thickness measurement and positioning. Featuring an intuitive two-line, eight-character display, the LE550 makes adjustments and menu navigation simple and easy to read. The visible red, Class 2 laser beam and small spot size ensure quick setup and alignment. The LE550 is also available with an optional metal, rotatable connector and multiple mounting bracket options, allowing operators to save time and money while accommodating flexible application requirements. For optimal use in demanding environments, the LE550 is enclosed in a rugged, die-cast zinc housing and includes a polycarbonate lens cover rated to IP67. All models meet Military Standard 202 G requirements method 201A, in addition to IEC 60947-5-2, to withstand applications subject to vibration or shock.